Rust, one of the most insidious and pervasive enemies of firearms is always present. Even in the dry desert climate of New Mexico, it is a problem, especially in houses with swamp coolers. Every hunter and shooter knows that rust is a problem. Most folks keep a rag around to wipe their guns down after a trip to the field. However, it is easy to forget or think, "I'll clean it later" and put the gun up. Later is often too late. Once rust gets a head start on your firearms, you are fighting a continuous battle with it for the life of the firearm. It is much more prudent to make it an unbreakable rule: wipedown and clean your firearm, as soon as possible after returning from the field. Dinner can wait, putting your dirty hunting clothes in the laundry can wait, but your gun should not! The acids and salts from our skin when using a gun give rust a head-start. Add in the moisture in the air and virtually every location in the world (except for the Sahara or Gobi Deserts) are fertile grounds for oxidation. Now comes the second problem. A lot of folks have their "rags" for wiping down their firearms in one place and "storage facilities" for the firearms in another. Again, it is all too easy to put the gun up and think, "I'll clean it later," but later often never arrives. Then, when you go to get your favorite gun for another shoot it is covered with rust. 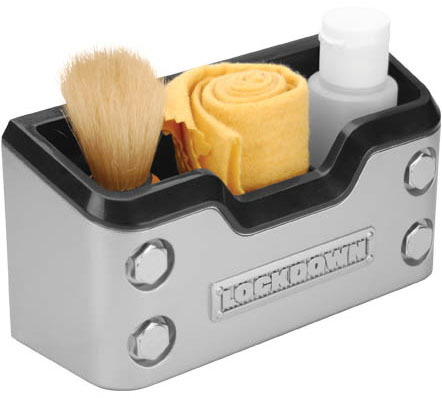 The Lockdown Wipedown Kit goes a long way in eliminating the mentality of "I will clean it later." Simply put the Wipedown on the wall next to your "gun area," inside or outside of your gunsafe, or at least in the same room with your guns, so that it is readily accessible. The Lockdown has an attachment system for installation in any vault. Clip inserts for use with carpeted interior vaults, as well as high-strength magnets for those safe's with bare metal interiors. The kit includes a brush for getting dirt out of small crevices in actions, a silicone cloth to wipe the gun down and a bottle of oil; everything you need to stop rust before it starts. At an MSRP of $24.99, this is an inexpensive insurance policy to protect your valuable firearms.